When thirteen year old Alex Gray is invited to spend Christmas in the North with his friend, Joel Flynn, he eagerly jumps at the opportunity. The holidays take an exciting turn when Joel receives a new snowmobile for Christmas, and he decides to enter the incredible machine in the upcoming Thunder Rally, a local snowmobile race. Christmas eve finds Alex and the Flynn family spending the evening with an older couple who live across the lake - Clarence and Agnes Sprague. Alex is then introduced to challenges that deal more with a spiritual nature. 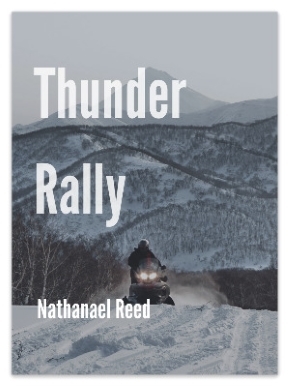 In the days following Christmas, Joel is seriously injured in a snowmobile accident, and with great trepidation, Alex reluctantly agrees to replace his friend in the Thunder Rally race. A number of valuable life lessons are woven into Thunder Rally's story-line. Agnes Sprague teaches Alex the importance of finding one's proper perspective in life, while Johnson is constantly reminding him of the need to focus. Alex comes to realize that taken together, these lessons are crucial in determining what's truly important in life. Nat Reed was an elementary teacher/principal for nearly 30 years and then taught full-time at Trent University's School of Education for another nine years. Nathanael has had 60 curriculum units published and more than 150 popular Novel Studies available online, these are also available in such outlets as Chapters and most stores for teachers. Nathanael lives with his wife, Joyce, and has four sons, Nathan, Jason, Eric and Joel who also reside in different areas of Canada.